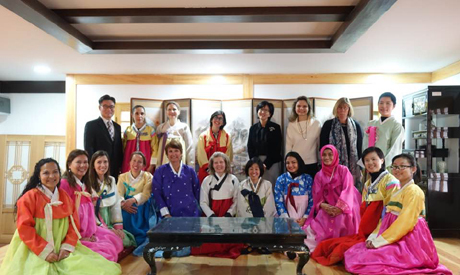 The Korean Cultural Centre in Cairo hosted a delegation composed of the wives of the military attachés in Egypt, as part of the framework of ‘Ahlan Korea’ (Welcome Korea) events organised by the centre to promote Korean culture. On 23 January, the South Korean Ambassador to Egypt Yoon Yeo Cheol welcomed the delegation, expressing his appreciation to the Military Attachés Association in Cairo (MAAC). Ambassador Yoon said that Korean culture has gained popularity through combining originality and modernity, and has a large audience in various countries around the world. “Drama, movies and K-pop together make up the most important Korean cultural components. Korean food as well has become well-known around the world, thanks to its enormous health benefits and fresh natural ingredients,” said the ambassador. The director of the Korean Cultural Centre (KCC) Yang Sang Keun accompanied the delegation in a tour at the centre to introduce them to its cultural activities and programmes, including Korean language courses and cinema screenings. Later the wives of the military attachés enjoyed wearing the traditional Korean hanbok. The Korean Embassy’s chef Daniel Park introduced the delegation to Korean cuisine in a special session, in which he explained how to prepare bulgogi, a grilled beef dish, dak-galbi, and spicy stir-fried chicken. 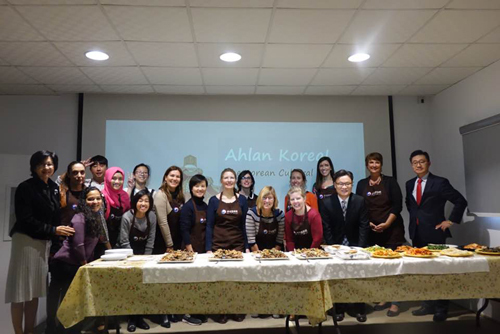 ‘Ahlan-Korea’ events are scheduled to continue this year on a monthly basis.